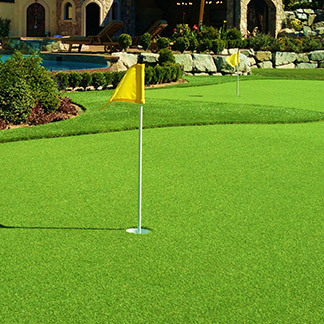 Spend less time maintaining and more time enjoying with Precision Greens’ artificial grasses. Who has time for yard work and maintenance these days? With everything you already have on your to do list, keeping up with lawn care has become one of those daunting and unwanted tasks, let alone time consuming and labour intensive. 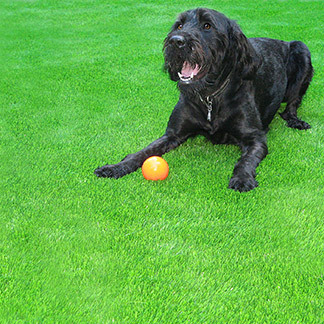 Save yourself the headache of all those needless chores and still have a comfortable, beautiful lawn by switching to one of Precision Greens realistic artificial grasses. Whether you just want a low maintenance yard, or even a top notch golf green installed, we can give any property the look it needs and deserves. 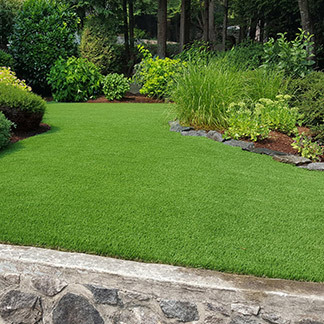 With a variety of textures and styles, we can customize the grass to fit any area and give your property a superior look. Here is how we can give you the best yard in Chilliwack. You can expect your neighbours will be stopping by to ask how your lawn always looks so amazing! 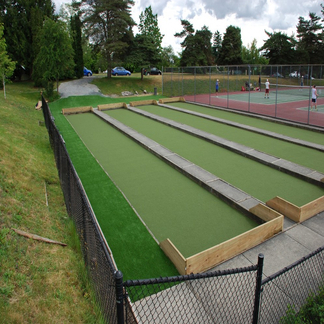 Variety: We have a wide selection and unique styles of artificial grass. From ultra-realistic, to something a bit more casual and comfortable. With such a wide selection, it’s ensured, everyone from a golfer to a home owner, has a stylish option to choose from. 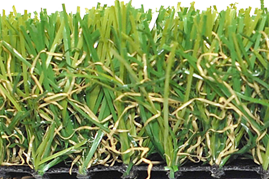 Realistic: Two revolutionary technologies have given us a chance to make an incredibly realistic artificial grass. The wave blade and then the U shape technology, has finally provided a product that is difficult to distinguish between non artificial and artificial. 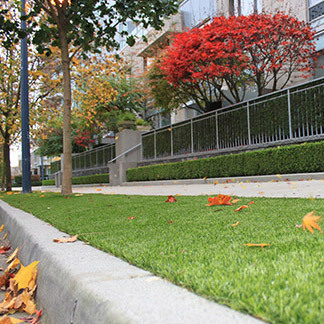 This ultra-realistic grass has an original colour scheme, mixed with an innovative shape and texture, give a look that matches natural grass blades. Design: Not only is it life like in design, but it can endure anything Canadian weather has to throw at it. 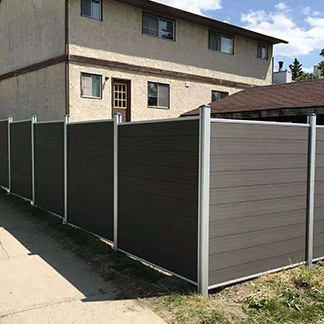 It can keep its colour and texture through large amounts of snow, rain, and even stay green when everyone else’s lawn has changed to an ugly brown. Safe: We have ensured all products are safe and user friendly and have been tested and proven environmentally friendly. The material even has non-flammable properties, so even in the driest of weather, any barbecues can go on without a concern. 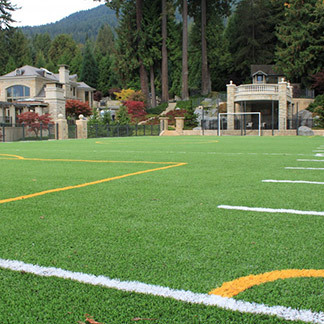 Comfort and Ease: With so little maintenance, you will love the simplicity of owning an artificial grass. The turf even allows for easy drainage into the earth below, from either the pets or that nasty rain that likes to flood lawns. This is all designed to leave you with a virtually maintenance free yard, so you can spend more time enjoying it. 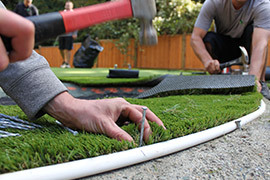 Easy maintenance: Cleaning the artificial grass is as easy as simply spraying it with the hose. Little to no clean-up is required and if you happen to have a pet that does their “business” on your lawn, the grass has been designed for simple clean up. Positioning objects high on the fibres for an effortless removal. 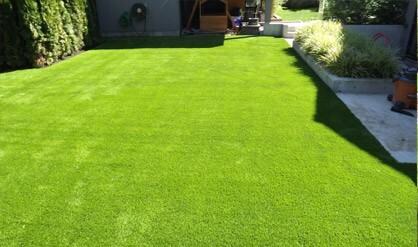 Reassurance: Precision Greens is so confident in its product and services, it provides a 10 year product warranty and 3 year workmanship warranty, allowing you to have worry free enjoyment of your new artificial grass.